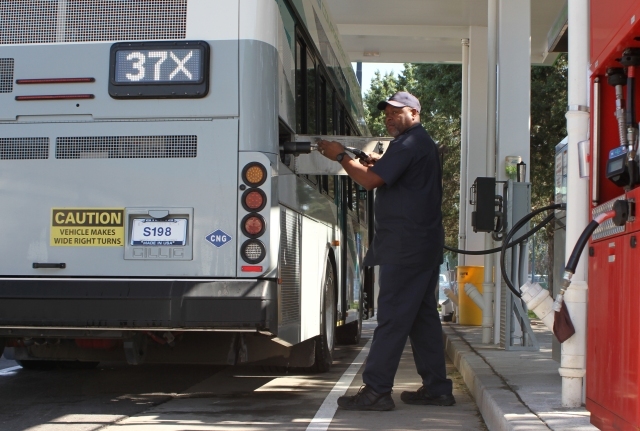 The Kansas City Area Transportation Authority (KCATA) reached a milestone on January: RideKC buses have used 1,000,000 diesel gallon equivalents (DGEs) of CNG since starting to use the fuel in August 2014. By reaching this milestone, KCATA reduced its greenhouse gas emissions by 1,870 metric tons, which is the equivalent of taking 395 passenger cars off the road for one year. In addition, the authority estimates it has saved $1.2 million over the cost of diesel fuel since making the change. KCATA has a partnership with Clean Energy Fuels, the largest provider of natural gas fuel for transportation in North America, to monitor and maintain the fueling station. At the time it was built, the CNG station was the largest fast-fill station in Missouri and is still the largest in the Kansas City region. The station allows buses to be fueled in less than seven minutes. The agency currently has 44 CNG buses in its fleet, and is adding 20 more arriving this year. CNG vehicles have been phased in as older diesel buses were retired.